We heart great bars, especially ones with personality and inventive drinks and food to boot. And it’s no secret that we heart Sweet Afton. This week’s article in New York Magazine about “Where to Drink” clearly shares our views, as we’re happy to report that Sweet Afton has been crowned the “Best Gastropub of New York.” Congrats Sweet Afton, we couldn’t be happier and continue to support your wonderful establishment. Sweet Tea – Sort of like a Long Island Iced Tea but so much better – it’s sweetened with honey-ginger syrup and spiked with tea-infused vodka. 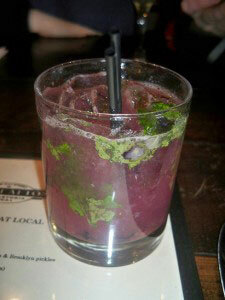 Blueberry Muddle (pictured above) – A festive brunch cocktail, it tastes like a breakfast mojito. 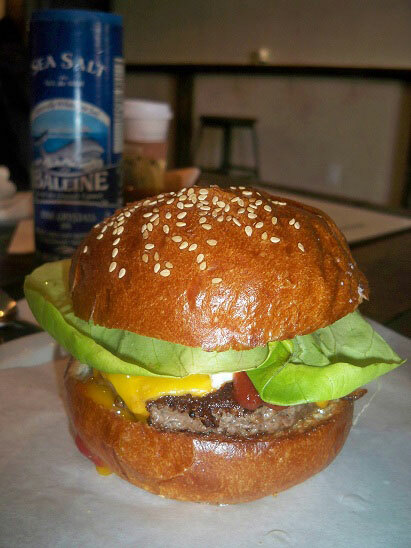 Breakfast Burger (pictured above) – Their regular burger made with Pat La Frieda meat, raised to the nth level with a fried egg in the middle. Fried Pickles – Yummy McLure’s pickles coated in soft, pillowy dough. One bite and you truly experience gluttonous perfection.